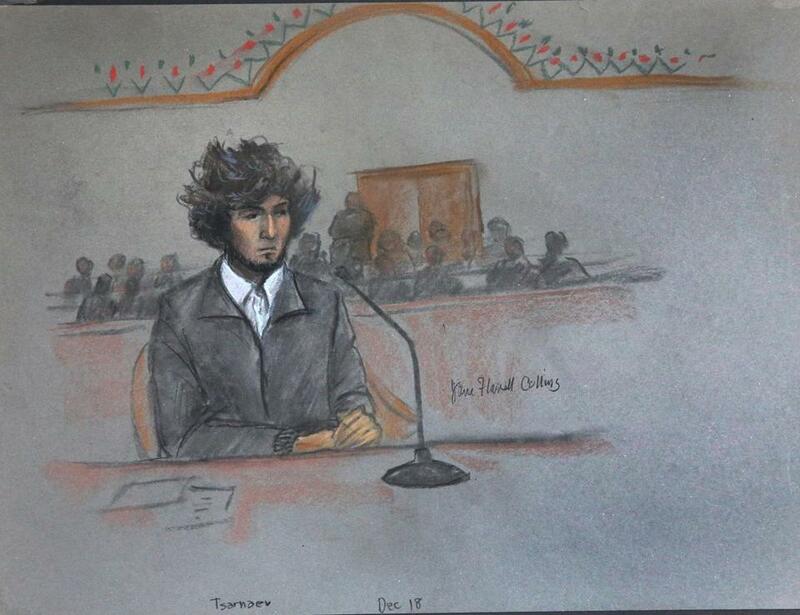 A courtroom sketch of Dzhokhar Tsarnaev. Lawyers for Boston Marathon bomber Dzhokhar Tsarnaev have flagged roughly 30 issues they plan to raise when he appeals his death sentence, according to a recent legal filing. Tsarnaev’s lawyers requested that the Aug. 20 deadline for filing their highly anticipated brief be pushed back to Nov. 18, citing their ongoing analysis of some 10,000 pages of transcripts in the case. “Even relative to other federal capital appeals and terrorism appeals across the country, the record here is voluminous,” David Patton, a member of Tsarnaev’s appellate team, wrote in the motion. Tsarnaev, 25, was convicted in 2015 for his role in the April 2013 Marathon bombings, which killed three people including an 8-year-old boy and wounded more than 260 others. He was sentenced to death and is currently incarcerated at a federal supermax prison in Colorado. Tsarnaev and his older brother and accomplice, Tamerlan, also killed an MIT police officer while they were on the run. Tamerlan Tsarnaev was killed in a confrontation with police in Watertown days after the bombings. In last week’s motion, Patton referenced Tamerlan Tsarnaev’s alleged involvement in a 2011 triple homicide in Waltham. No one has been charged in that case. Patton listed additional issues that Tsarnaev’s team expects to raise on appeal.